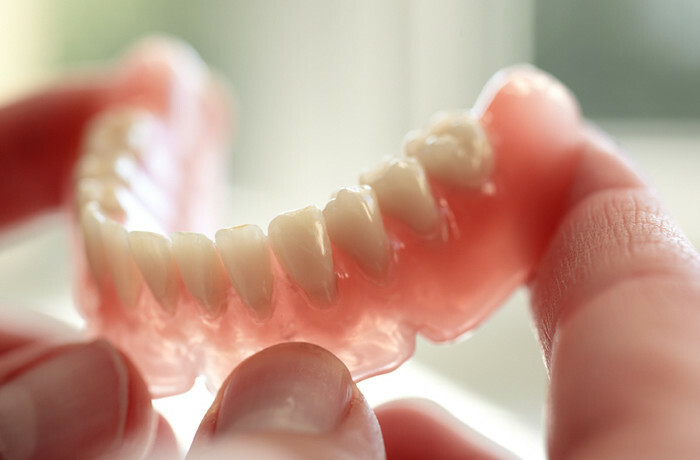 Patients, who have several teeth missing or are left with no remaining teeth due to disease, decay, or trauma, often turn to dentures.Partial dentures can be used if there is an indication of some serviceable teeth present for support in conjunction with the gums and jawbone. A partial denture is removable and provides form and function for those with missing teeth. If there is no support structure, then full dentures are recommended to maintain a proper bite, to chew properly, and to prevent a sagging facial expression. The beauty of dentures today is that they are designed to be comfortable and functional and are similar in appearance to natural teeth. The best starting point to see if dentures are an option for you is to see our dentists. Dentures may feel a little loose at first, especially lower complete dentures. It takes some time for the dentures to ‘bed-in’. The muscles of the cheeks, lips and tongue need time in getting used to the dentures. These areas need this time to learn how to keep the denture in place without your thinking about it. Wearing the dentures for the first night after fitting may help you adjust, but after this take them out every night. However even the best complete lower dentures will never feel as secure as upper dentures. This is unfortunately one of the unavoidable lower denture problems. While getting used to dentures, it may be useful to use a denture adhesive. There are many types including gels, pastes and strips. Adhesives can give extra confidence when eating and speaking as your mouth is adapting to dentures. However in the long term they are not usually necessary with well-fitting dentures. Getting used to eating with your new dentures will also take time and is one of the common early denture problems. Start with liquids and soft foods such as soups, soft bread and eggs. Avoid harder-to-eat foods at the beginning. Build up your exposure to these harder foods over time, once you are more comfortable. Have patience and stick at it! You will soon master eating more difficult foods.You will need time to learn new mouth movements and learn where to chew down on food. ●Cut food into small pieces. ●Don‘t bite up and down on food with your front teeth. This may dislodge the dentures. ● Use the side and back teeth more at the start. Use a sideways chewing motion to eat food. ●Don’t tear or pull food when eating off a fork. ●Having food on both sides of the mouth can help keep the dentures balanced. It is important that you stick with learning to eat more difficult foods. ●This will enable you to get a healthier, more varied and balanced diet. Again, speaking normally will take practice. The first three days or so are the most difficult. The dentures themselves will feel awkward to speak with. This problem will also be compounded by increased saliva flow in the first few days. Practice and a little patience are needed in these few days. Your speech will soon return to normal as you get used to things. Some words will remain difficult for longer. Practice saying these words aloud. Certain extreme movements such as coughing, sneezing and yawning may dislodge the dentures. This is normal until you get used to these strong dislodging forces on the dentures. Cleaning your dentures is a new skill that will also need time to learn. Common denture problems are a result of poor oral and dental hygiene. If not looked after, plaque can accumulate causing gum disease around, and decay of, remaining natural teeth. Fungal infections such as thrush are also a common problem under dentures if they are not cleaned properly and if not removed every night. A very small percentage of people can be allergic to the acrylic used in dentures.